The new Roost Laptop Stand is the world's most portable, eye-level laptop stand. It elevates your screen to prevent 'laptop hunch'. Used with a portable keyboard and mouse, or next to your desktop monitor, the Roost Laptop Stand transforms your laptop into a posture-perfect desktop workstation... anywhere. Enables freedom to work anywhere - The modern technology worker values the freedom to practice their craft anywhere. The Roost Laptop Stand collapses into an impossibly small 1" x 1" x 13" package and is a featherweight 6.5 ounces. Used with a Bluetooth keyboard and mouse, the Roost creates an ergonomic workstation that is, for the first time, truly as portable as your laptop. Saves your neck and back - We love our laptops, but their use forces head-down, back-hunching, hand-contorting posture. Constant poor posture, over time, leads to a weakening of core muscles, joint dysfunction and nerve irritation. The Roost breaks this paradigm by elevating your laptop screen up to eye level. When used with an external keyboard and mouse, the Roost turns your laptop into a posture-perfect desktop workstation. Fits your height and desk - Adjusting your workstation to match your body and environment is critical for maximum comfort and productivity. The Roost provides rapid height adjustment to fine tune your monitor to match your eye-level. Easy to use - One easy motion to open and close the Roost. In seconds you can stop the hunch. Packing up is just as easy and quick, the Roost won't slow you down. Improves your output - We are at our best when addressing our work with full, upright attention. Sitting with upright posture increases focus and minimizes stress on structural joints and muscles, resulting in getting more done over longer periods of time. Extremely stable - Your laptop needs to be safe and stable when lofted up off the desk. The Roost uses a patent-pending Pivoting Grip mechanism to securely latch on to your laptop, keeping it safe from unexpected bumps. The statistics are staggering: greater than 50% of college-aged kids today report pain from computer use. 1 in 7 can't spend more than 1 hour on a computer before they are limited by some form of neck, shoulder, or wrist pain.¹ The potential exists for more than 2.5 million students to develop injuries to the upper body, arms and back (upper extremity musculoskeletal disorders) before they even enter the workforce.¹ And now schools are issuing laptops to every student. But how to use a computer while minimizing negative health effects is far from a new problem. Ergonomics tells us to sit with an upright and neutral posture, with arms hanging neutral by our sides. The challenge is that technology is now so portable and powerful, we often end up doing a majority of our work in impromptu locations--at coffee shops, the kitchen counter, hotel rooms, airports, or the library. Those of us whose laptop never leaves our side often don't think twice about the contorted positions our bodies are in until the sore neck or wrists become impossible not to notice. James shared his experience with his physical therapist: "My doc said 'he sees younger and younger patients every year, they've been on cellphones and craning their necks on laptops since they were 10. Their body final gives out when they are in their twenties.'" In the past, corporate wellness and ergonomic programs ensured employees had the proper ergonomic setup, because Repetitive Strain Injuries (RSIs) are costly and account 29% of all workplace injuries. But with the rise of the independent contractor and remote workers, many are left to patch together a solution of their own. "Keeping your body healthy is really important, especially when your livelihood depends on it" says James. How We Got to Now: Why the Original Roost, and Why the New Roost. At age 26, James the Roost's creator lost ability to type. He spent too long hunched over a laptop, relying on youthful invincibility. His hand doc directed him to look for a solution that got his laptop screen to eye-level, finding nothing suitable that was also portable, James started tinkering (he's an aerospace engineer by trade). That was 4 years ago. 2 years ago the original "Roost Laptop Stand" was launched and resonated with a large group also looking for a "laptop hunching" solution. Success on Kickstarter: 2500 backers, ~$200K raised, and now making the Roost is what James does. The Roost solves the "work from anywhere...while being ergonomic" problem for the first time. It's folding, ultra-lightweight design makes it extremely portable. Use the Roost with a portable keyboard and mouse, and you have a posture-perfect desktop workstation... anywhere. That original design sold 10,000 units and has a cult following among the digital nomads, the generation of 4-Hour-Work-Week-inspired globe-trotting entrepreneurs, as well as the rest of us whose livelihood runs through our laptop. Why $475,000 Kickstarter Goal? That lofty goal is the bare minimum to pay for the expensive tooling to get the new Roost off the ground. The new Roost will be manufactured on 13 high-precision stainless steel injection molds, in Denver, CO, USA. Each mold alone costs $15,000 - $55,000 to produce, totaling over $300,000. (For reference, the Coolest Cooler wrote a $1.2M check for it's production injection molds) The all-or-nothing $475K goal will raise the funds to cover this start up cost and make the Roost a reality. Roost 2.0 Raises $785,724 on Kickstarter! On July 7, 2015 Roost 2.0 completed its Kickstarter campaign and production begins! The Roost Laptop Stand fits almost all laptops. James realized that working from a laptop--e.g. an ergonomic disaster--meant wrecking his back, neck, wrists, hands, and, thus, livelihood. Finding that nothing existed to solve this problem, his inner engineer piped up: "Build it." "The Roost Laptop Stand" is the over-engineered, obsessively designed, offspring of that big necessity. Roost World HQ is in the heart of Denver's RiNo District. RiNo is home to hundreds of creatives, including architects, art galleries, ceramicists, designers, furniture makers. 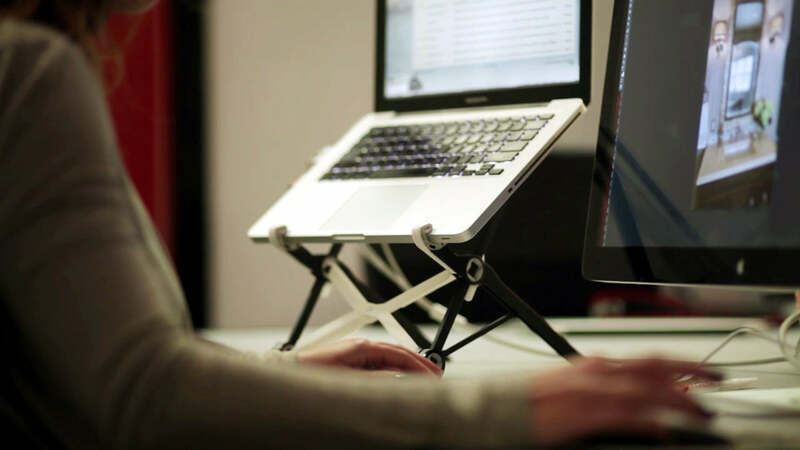 The Roost Laptop Stand is designed and built in the USA.